As this print illustrated, Abraham Lincoln was just one candidate among many. Lincoln had been active in Illinois politics for much of his life. He had served many years in the state legislature and one term in the U.S. House of Representatives. In the 1850s he helped establish the Republican Party. He gained national attention for his well-publicized debates with Stephen Douglas in the 1858 Illinois senate campaign and for his 1860 speech at New York City’s Cooper Union. Senator William H. Seward of New York was the front-runner among Republicans, but his supporters could not put together a majority of delegates. On the third ballot, Lincoln emerged as the convention’s compromise candidate. In 1886 Volk’s son sold the casts of Lincoln’s face and hands to a group that proposed having the sculptor Augustus Saint-Gaudens make a limited set of replicas. In 1888 the 33 supporters of this project presented Volk’s personal copies of the life mask and hands, along with bronze replicas produced by Saint-Gaudens, to the U.S. government for preservation. The donation was made on the condition that “the original plaster casts should never be tampered with.” Any future casts could only be made from the bronze replicas. 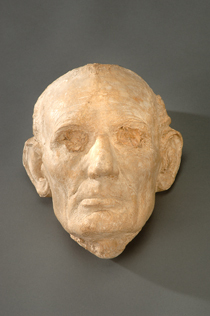 Chicago artist Leonard Volk produced this plaster life mask of Abraham Lincoln in April 1860. 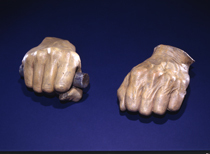 Volk made the casts of Lincoln’s hands on May 20, two days after the Republican Party nominated him for the presidency. Lincoln’s right hand was still swollen from shaking hands with supporters. To steady his hand in the mold, Lincoln went out to the woodshed and cut off a piece of broom handle. Volk later placed the piece of handle in the cast displayed here. "There is the animal himself!"